Majestic Chocolates creates exceptionally delicious chocolates. The finest ingredients are used and each batch is made by hand and each piece hand dipped. We are located in the heart of the Oregon Wine Country, McMinnville. Whether you are looking for an impressive gift for someone special, your customers or just a dark chocolate indulgence for yourself; Majestic Chocolates has a great selection of truffles, fondants, caramels, brittles and bark bars. Place your order today along with your flavor requests and desired ship date. Please provide us time to make your order as on hand quantities on most items are limited and seasonal. 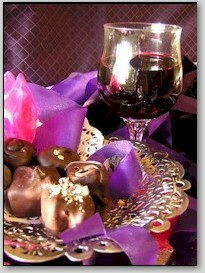 We welcome custom orders for events such as weddings, celebrations, wine club events, corporate parties and promotions. Schedule: Majestic Chocolates is open for individual box orders from November 15th to December 20th each year. Custom orders over $200.00 are available the rest of the year, Please call to plan flavors, amount and date needed. 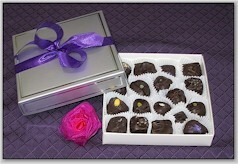 Care of your chocolates - Majestic Chocolates uses no preservatives! Please keep in an air tight container at 40 to 60 degree F; warm to room temperature for best flavor. If not consumed within two months, place in freezer bag and freeze up to 12 months. Thaw chocolates in the freezer bag slowly as condensation will ‘gray’ the chocolates. Graying will not affect the flavor, just the appearance. Copyright © 2013 Majestic Chocolates Inc. All rights reserved.